Hyatt Zilara, Cancun. Book at Tropical Sky today. 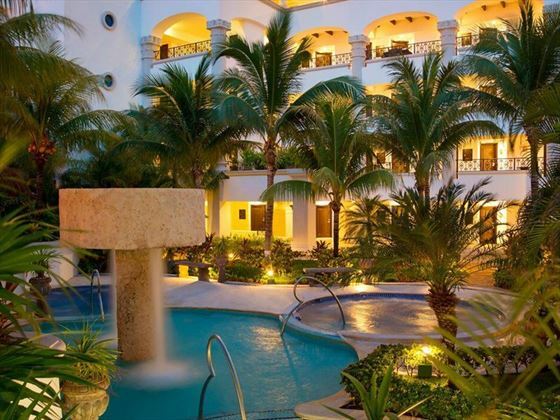 Travel to Hyatt Zilara in Cancun, on the sandy Zona Hotelera, and you’ll be welcomed in to paradise. 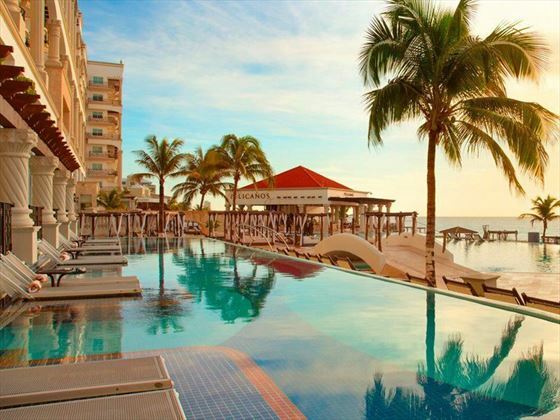 An All-Inclusive, adults only resort with incredible views of the Caribbean Sea, luxury suites and waterfront dining, the Hyatt Zilara is the perfect place to spend a sun-soaked holiday on the beach. 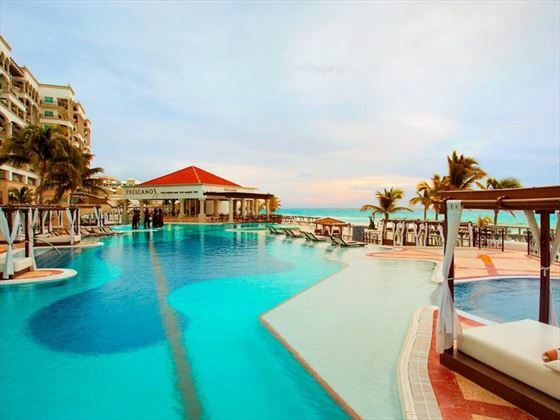 With oceanfront pools, Butler services and plenty of entertainment, you’ll feel like royalty in this extravagant Mexican retreat. 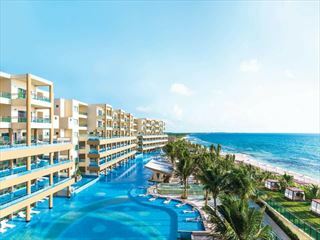 Hyatt Zilara is located in the vibrant Cancun Hotel Zone, in the heart of beautiful Cancun and along the Yucatan Coast. 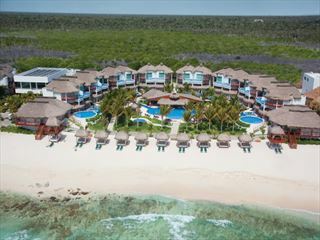 The resort is moments away from lively nightlife, restaurants, golf courses and shops, or you could simply stroll to the beach for a peaceful ambience. Zilara King or Double Junior Suite – Sophisticated suites sleeping up to four people. 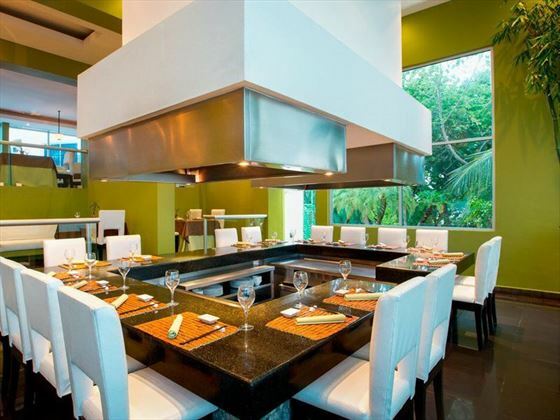 Featuring gorgeous views of the resort grounds or the Caribbean Sea, a furnished balcony, and a whirlpool hot tub. Zilara Ocean View King or Double Junior Suite – Spacious suites with a large terrace overlooking the beach, featuring Club Level amenities including complimentary fruit and yoga mats. These suites sleep up to four people. Zilara Ocean Front King or Double Junior Suite – Airy suites with scenic views of the ocean and direct access to the beach. 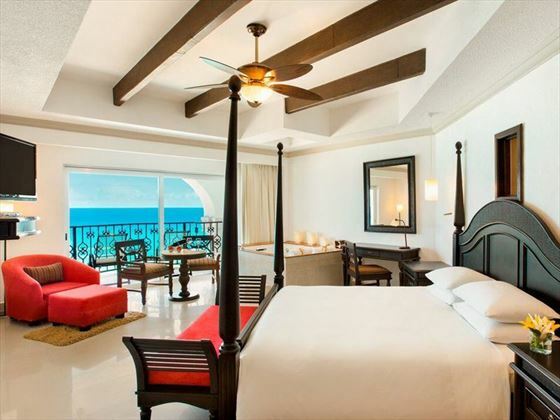 These suites also feature an extra-large balcony and Club Level amenities, and sleep up to four people. Zilara Ocean Front King Luxury Suite – Smart suites with views of the ocean, plus a comfortable seating area and furnished terrace. These suites also have Premium Suite amenities, including priority access to Chef’s Plate and use of the SPAzul hydrotherapy suite, and sleep up to two people. Zilara King Ocean View Swim-Up Suite – Luxurious suites with direct, semi-private access to the resort’s winding swimming pool. The terrace leads on to a living and dining room area, and guests also have access to Premium Suite amenities. 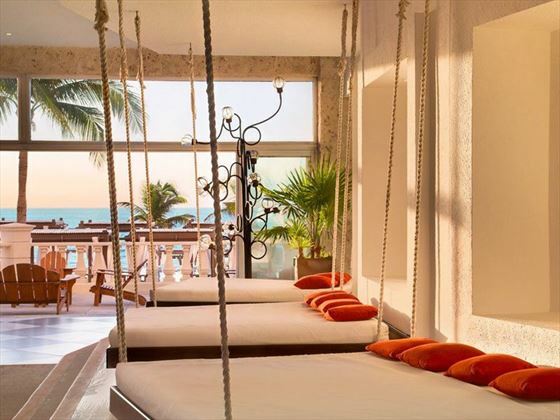 These suites sleep up to two people, and only guests at 13+ may stay in swim-up suites. 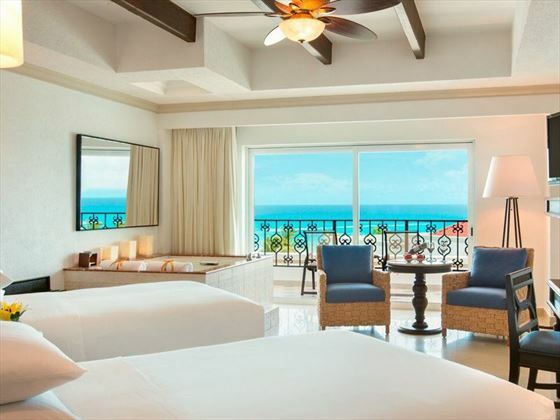 Presidential Suite – Exclusive penthouse suites located on the top floor of the resort, with an extensive living/dining area featuring a kitchenette, and beautiful ocean views from the furnished terrace and main bedroom. These also include Premium Suite amenities, and sleep up to two people. Tapas & Pintxos – Romantically share sumptuous Spanish tapas in this authentic, classy restaurant that is open for dinner and has a Resort Casual dress code. Asiana – Watch as your Asian fusion cuisine is cooked right in front of you Teppanyaki style, a feast for the eyes and the taste buds. Open for lunch and dinner with a Resort Casual dress code. 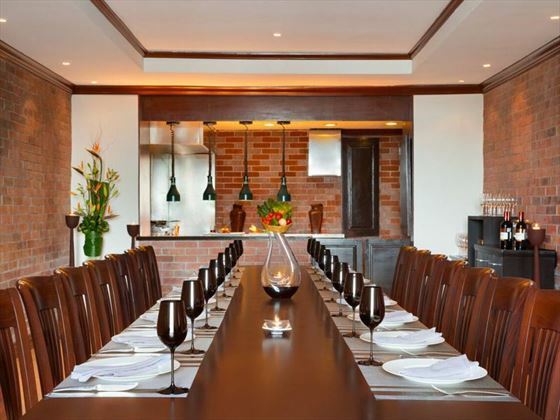 Maria Marie – Tuck in to national and regional Mexican favourites in this cosy setting, open for dinner with a Resort Casual dress code. Chef’s Plate – Feel like royalty with a multi-course gourmet meal, created by internationally trained chefs and using only the freshest ingredients. 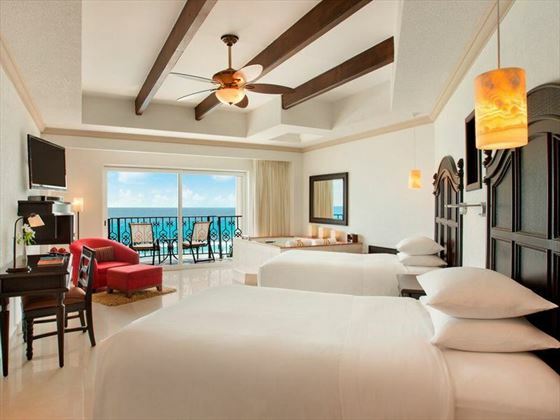 Available for Junior Suites Oceanfront and Premium Categories. Sittings are at 6pm and 8pm, and there is a Resort Casual dress code. 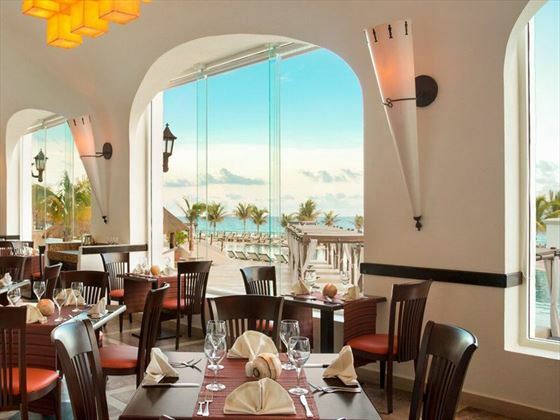 Spice – Dine your way through delicious buffets for breakfast, lunch and dinner, whilst overlooking the Caribbean Sea. A Resort Casual dress code is desired. 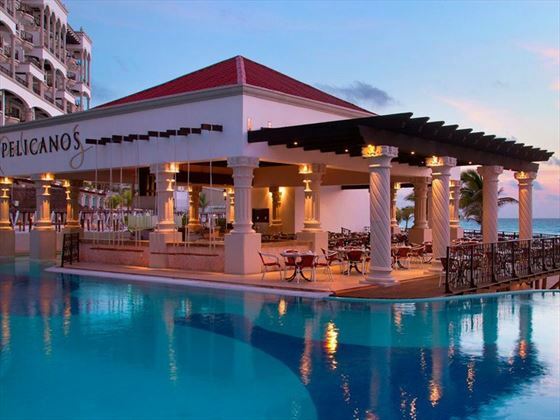 Pelicanos – Enjoy freshly caught seafood, cooked with a Caribbean Fusion and served in an open-air restaurant with sweeping views of the ocean. Open at breakfast, lunch and dinner, this restaurant has a Casual dress code. Lobby Bar – Savour beverages created by expert mixologists, plus a wide choice of fine wines, champagne and imported beer. Open 9am-midnight. 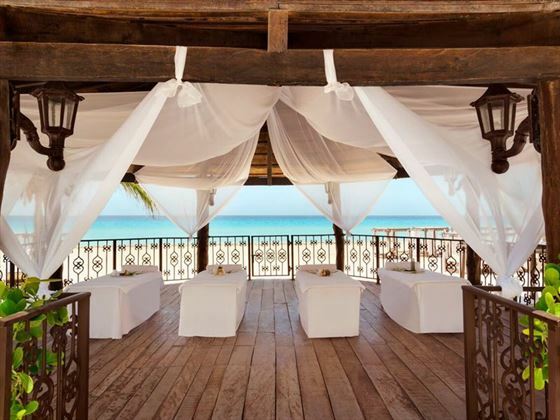 Tequileria Beach Bar & Lounge – Sip on authentic Mexican tequilas as you watch the waves gently lapping on the beach. Open 2pm-midnight. 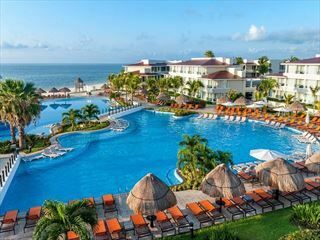 All facilities and activities as listed above are included in the All-Inclusive package.